When: Saturdays 22:30 – 24:00. I will definitely be tunning in everytime I can. 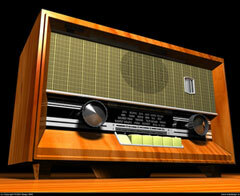 If you now of any other stations please feel free to post a link on the comments section. The great Russian cellist, dies at age 80. Rostropovich entered the Moscow Conservatory in 1943, at the age of 16, where he studied not only the piano and the cello, but also conducting and composition. Among his teachers were Dmitri Shostakovich and Sergei Prokofiev. In 1945 he came to prominence as cellist when he won the gold medal in the first ever Soviet Union competition for young musicians. Rostropovich was a huge influence on the younger generation of cellists. His talent also inspired compositions from numerous composers such as Shostakovich, Khachaturian, Prokofiev, Britten, Messiaen, Dutilleux, Bernstein, and Penderecki. Rostropovich’s health declined in 2006 and was admitted to a Paris hospital at the end of January 2007, but then decided to fly to Moscow, where he had been frequently receiving care. 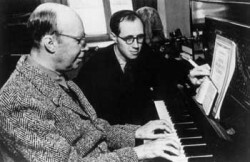 Obituaries cited sources stating that the cellist suffered from intestinal cancer, while other sources report, he re-entered the Blokhin Cancer Institute on April 7, 2007, and died on April 27, 2007 (picture: Prokofiev and Rostropovich. Moscow circa 1950). Why is “Ugly” Music so Hard to Understand? Vienna (AFP) – The complete printed NMA (New Mozart Edition) is now available to download from The Mozart Institute website: “The purpose of this website is to make Wolfgang Amadeus Mozart’s musical compositions widely and conveniently accessible to the public, for personal study and for educational and classroom use,” the Mozarteum said in a statement. The website draws from the original Neue Mozart Ausgabe paper version developed since 1954 by internationally renowned musicologists and comprising over 125 booklets of sheet music, whose origin has been painstakingly authenticated, the Salzburg foundation said. The “Digital Mozart Edition” (DME) website (http://dme.mozarteum.at) features over 600 works by Wolfgang Amadeus Mozart, separated into ten categories, from concertos for orchestra to chamber music and pieces for piano. This is a condensed version of an interview with British composer and conductor Oliver Knussen (b. 1952) by Paul Griffiths. It’s part of several interviews included in Griffith’s “New sounds, new personalities: British composers of the 1980’s ” (the format of this interview is similar to the format we will be using at composersnewpencil.com for interviewing composers and performers). Oliver Knussen’s music occupies a regularly revisited place in concert and opera programmes worldwide. His Third Symphony, his opera Where the Wild Things Are and Violin Concerto are among the most frequently performed British works of recent times. Paul Griffiths: Do you keep regular hours for composing? Pierre Boulez conducting the Ensemble Intercontemporain, with singer Anna Steiger, in a 1991 concert recorded at the Alte Oper Frankfurt, Germany. 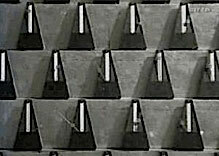 Born in Paris, 22 December 1883, Varèse referred to his basic ideas as “sound masses”, or elements of musical sound characterized mainly by their instrumentation, registration, rhythmic shape, intervallic relationship, and volume. Offrandes, for soprano and chamber orchestra was written in 1921, and was his first work to be performed in the US. It is divided into two sections, both of which are settings of poems in French. Varèse’s catalogue contains only a handful of surviving pieces (the pieces written before 1920 were all destroyed by him or lost in a fire), but he is now considered to be one of the principal innovators of the first half of the 20th century. He died in New York, 6 November 1965.